All you need is blue -- or green. Apparently it doesn't matter now. Troy made this switch last October. And County Waste, the big private trash hauler, has been transitioning since the end of 2009. A flier with details about the constant "Can this be recycled?" question is after the jump. * Right or wrong, we've been one-binning for months after we didn't get a green container. The stuff disappeared each week, so... uh... maybe it was OK.
+ How does pay-as-you-throw smell? at least we know the city isn't wasting money on graphic designers. Ummm, yeah I've been "one-binning" for almost two years. I never had the green one and I'm pretty sure I read in the City's recycling pamphlet that the green one was optional anyway (otherwise I would have asked for one). So, I'm not sure what's really changing here. Maybe they sorted the paper out on their end. I think the green bin was optional. But you were required to divide the blue bin in a very specific way. Paper on the bottom, tied with twine. Then glass, plastic, and cans divided on top. My guess would be only about half of people on my block even tried to follow that procedure. To Blech: Many have had your experience. If I had to guess, they weren't sorting it out on the other end and much of it probably ended up in the trash, i.e. landfill. What is different now is that they are actually sorting (otherwise they wouldn't have made the announcement). People have witnessed DGS employees throwing the different containers into the same pool for at least a few years. The upside (although it should not have had to come to this) is that down the road the landfill can be mined for recyclables. Either by sanitation workers or by the rest of us as our society careens toward collective indentured servitude. Holy crap! I live in Troy and had no idea that I didn't have to sort recyclables anymore! By Single Stream - I think they really mean they're going to take my recyclabes and throw them in the garbage truck. I've watched them repeatedly do this. So frustrating. Dude, I had been doing single stream the entire time I lived there. I just had a blue bin and never saw any of my neighbors use a green and blue bin. 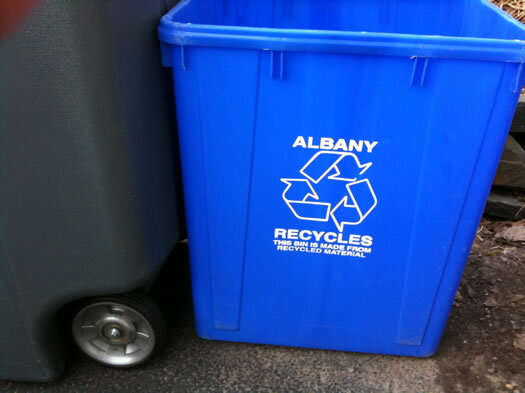 Albany should be composting too. Other cities divert a tremendous amount from landfill by offering weekly curbside pickup of ALL compostables, including table scraps, diapers, kleenex....everything goes in a neat, tight bin with a latch. Toronto has been doing this for a decade. Not sure why we're not.